Waveney Lodge is situated on the edge of the River Waveney floodplain, c.500m north of the settlement core of Low Street and the parish church, and on the perimeter of the Hoxne Hall/Oakley Park estate. The property is of 19th century date, being shown on the 1st Edition OS but not on the Tithe map, where it is shown as an arable field (named in the apportionment as 'Pasture Close' and owned by Sir Edward Kerrison). The property is presumed to be associated with the remodelling of the former Hoxne Hall by the Kerrison family. 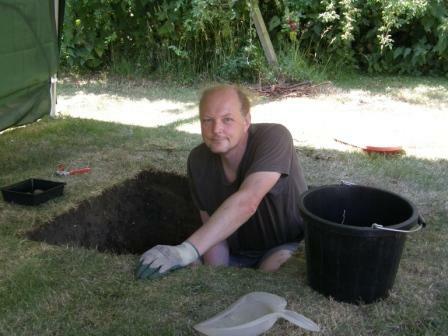 The test pit was placed in an area of flat grass lawn 11m to the west of the house. A thick garden topsoil layer of dense and hard grey/brown sandy silt, with occasional small stones and chalk and charcoal fragments extended to a depth of 0.65m. Beneath this was a thin layer of irregular blue/grey clay deposits, Context 2, and then the natural subsoil, Context 3, of orange/brown sandy silt which was seen at a depth of 0.7m. The finds were all recovered from Context 1. The earliest pottery are fragments of Tin-glazed earthenware (TGE) and Glazed red earthenware (GRE, 16th-18th century) but most of the ceramics are Victorian or later. 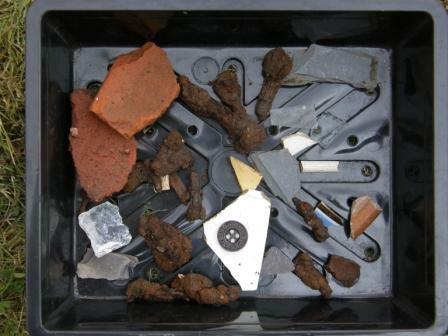 Post-medieval ceramic building material, clay tobacco pipe, glass, slate, plastic, iron nails and modern metalwork were also identified. A discrete assemblage of animal bone, thought during excavation to probably be a pet burial such as a cat, has been identified as a bird skeleton. The uniform deep soil profile and mixed range of post-medieval material is consistent with the previous known land-use of the site as a 19th/20th century property on a former open field. The earlier earthenware sherds were probably deposited via agricultural practices such as manuring while the later finds relate to the occupation of the house. The patchy layer of clay may be an alluvial deposit on the edge of the floodplain.